Walnut Hill Cemetery’s regular services include basic grooming and upkeep of the lawns, trees, shrubs and landscaping. Maintenance, repair and cleaning of the monuments is up to the individual family and can be contracted through our maintenance department. Cremations are increasingly popular, and Walnut Hill Cemetery now features a columbarium (at left). 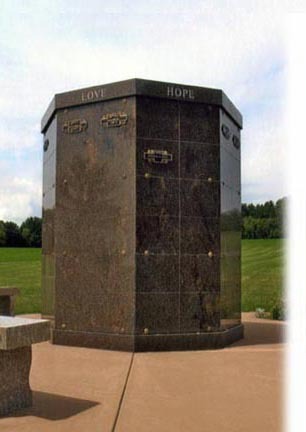 There are some legal restrictions to scattering ashes on public or private property, and this columbarium offers a safe, secure and permanent alternative that is less expensive than a traditional grave plot. Both double and single units are currently available. Please call us at 608.356.5646 for details and pricing. Complete Rules and Regulations for Walnut Hill Cemetery are available here.